Poster Printing is rated 4.7 out of 5 by 10. Rated 5 out of 5 by Kevin S. from Amazing as Always! We sell these posters through out online store at icecollaborate.org/bookstore. As always, 48print has done an amazing job and our customers have been purchasing them and providing positive reviews! Thank you! Rated 5 out of 5 by B walk from High quailty!! Fast, quality is what 48 hours is all about...thanks again for making me look great! Rated 3 out of 5 by Adela from Just ok Colors were not as vibrant as the last order. This order looked very generic-made. Posters are the go-to promotional tool for announcing events and advertising a new business or its latest products. Whether displayed in store or within areas close to the promoted venue, custom poster printing can be utilized to widen your reach. 11" x 17" is the standard option for smaller posters. It’s also the go-to size for announcements made in community spaces like a bulletin board. 18" x 24" is the medium size for designs that are prominently displayed indoors and outdoors for larger advertising or event campaigns. 24" x 36" is among the larger sizes normally displayed in outdoor venues. The best choice for big events such as concerts, trade shows, and conventions. Those who require a specific poster size can indicate the dimensions in our custom quote order page. It’s important to do your poster printing on paper that complements the design. We offer 4 premium materials suitable for any type of promotion. Upload the file and your poster printing order can be ready by the next business day. If you’re still unsure how to start, download one of our available templates to design your own poster. 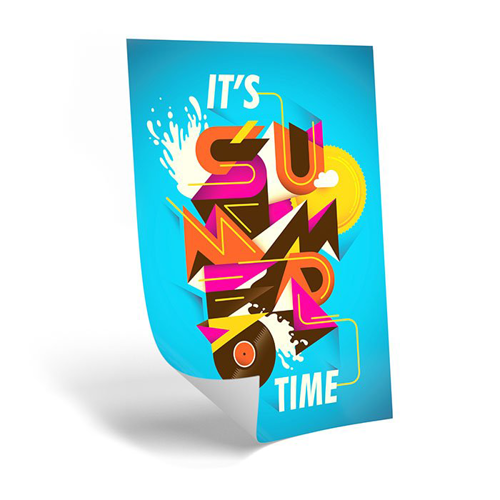 At 48HourPrint, you can make your own poster fast and easily but without sacrificing quality. When can I expect my custom poster printing order? Your order can be ready after one business day. The printing turnaround refers to how long it takes to produce the posters. Turnaround begins once you have paid the uploaded order. If you have opted for a free PDF proof, the turnaround time begins after the proof’s approval. Note that the time doesn’t include shipping transit time, weekends, and holidays. Which material and coating is ideal for posters displayed outdoors? The 100# Text, 100# Cover, and 14 pt. C2S Cover Stock come in high gloss UV coating that’s ideal for outdoor displays. High gloss UV is abrasion and marks resistant. It also has the highest shine and adds vibrancy to every color.